The Jack Brumbach, Barris-built 1942 Ford is one of those really great looking early 1950’s Customs we know way to little about. Never featured in any magazine and it disappeared before it made a name for itself. 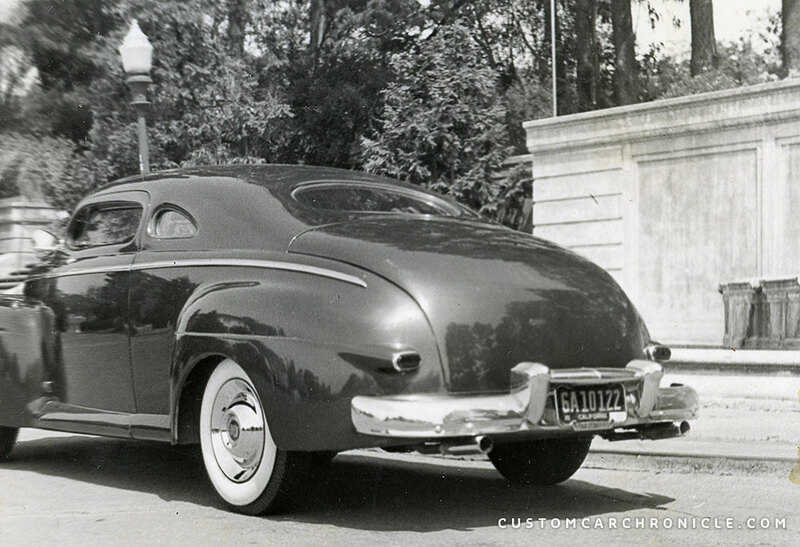 The first time I heard about the Jack Brumbach 1942 Ford was when I saw a single photo of it in Andy Southard’s excellent book Custom Cars of the 1950’s. 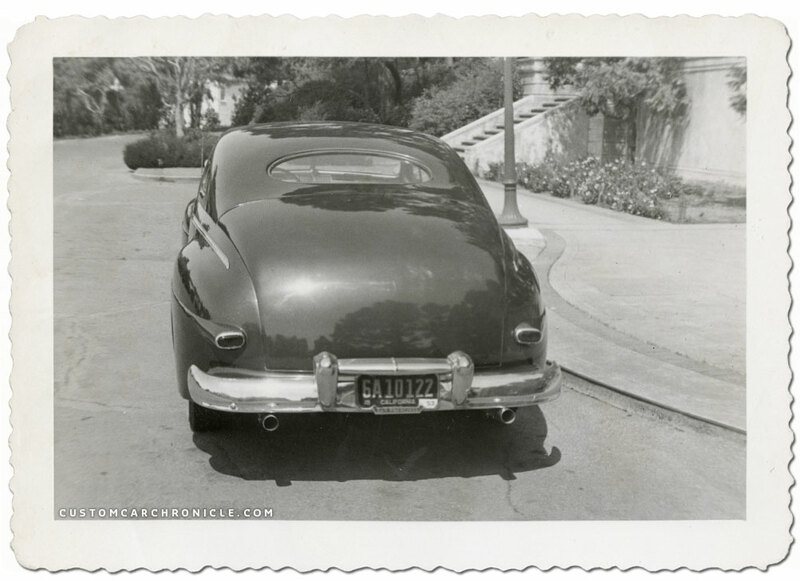 Andy had taken a photo of the car at the 3rd Annual Motorama show held in the Pan Pacific Auditorium in November 1952. 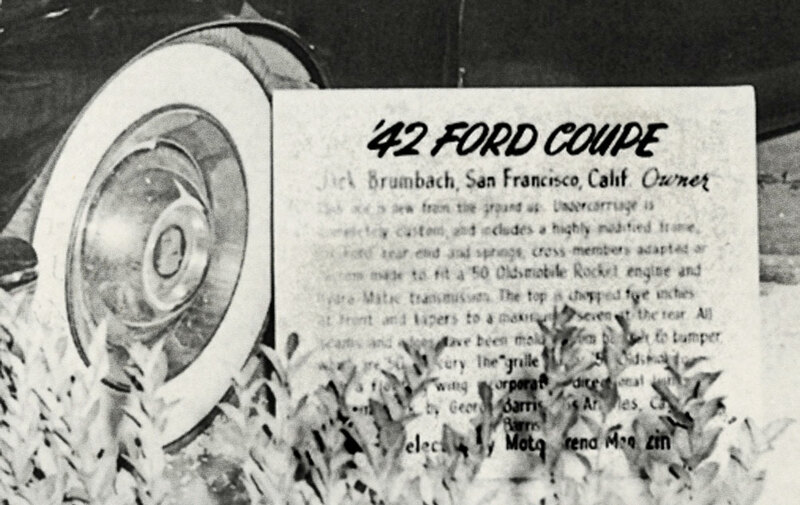 In his book he mentioned that Jack Brumbach was the owner of the ’42 Ford coupe and that he was from San Fransisco. The car was listed to have a chopped top of 5 inches in the front and 7 inches in the back. Andy also mentioned that the original flathead Ford was replaced with an 1950 Oldsmobile Rocket V-8 engine with Hydra-matic transmission. Sadly the show sign made for Jacks Ford is hard to read due to the use of a flash light. But we can make out that it mentioned that the frame was highly modified and that the car was elected for something by Motor Trend magazine. But as far as I know the car has never been show in that magazine. Jack’s 1942 Ford looking really great at the 1952 Petersen Motorama show in the Pan-Pacific Auditorium. This is as far as I know the only photo ever to be shared publicly that shows the car with the perfect Barris stance skirted rear fenders. Part of the Barris / Carson Display wall with parked next to it on the right is Don Vaughan’s 1947 Buick convertible and on the left Dan Landon’s 1949 Chevy. The fact is we do know very little about the Jack Brumbach 1942 Ford, or even about Jack himself. The styling on Jack’s Ford looks very much like it could have been done in the late 1940’s. Styled along the lines of the Jesse Lopez 1941 Ford, or the Marcia Campbell 1942 Ford both of which where built in the late 1940’s. However the parts used on Jack’s 1942 Ford indicate that the car was at least finished in the early 1950’s. with the 1950 Oldsmobile grille surround, same year Henry J grille and Mercury bumpers. We do not even know what color Jack’s Ford was. So far nobody was able to confirm the color. When I interviewed Jack Stewart in 2010, for the Jack Stewart Ford book, I asked him about his friends back in the early 1950’s and the cars they drove. He could remember Jack Brumbach, but he could not remember which color the car had, he did remember Jack Brumbach from the times he met him at the Barris shop and some of the shows he went to. 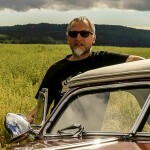 Stewart could only remember that Jack Brumbach did not hang out with the other Custom Car friends Jack had, he did not cruise with them to Balboa, Big bear and other locations the Kustom Los Angeles guys went to. “He was from Long Beach I think… or perhaps even further, not from around here. And the roads were to bad to travel the Customs so much. So some of the guys we only saw at the bigger car shows we went to”. 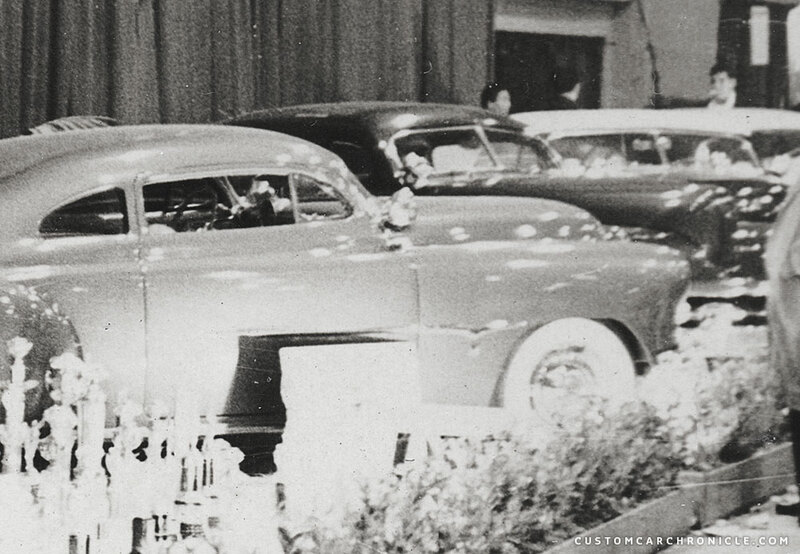 Cropped from a big photo, hence the poor quality shows Jack’s Ford fro the other side at the Barris Display wall at the 1951 Motorama show. The car in the front is the Barris/Ayala built Dan Landon 1949 Chevy. Only part of Jack’s 1942 Ford shows, but since there are so few photos of the car I wanted to show this one here as well. 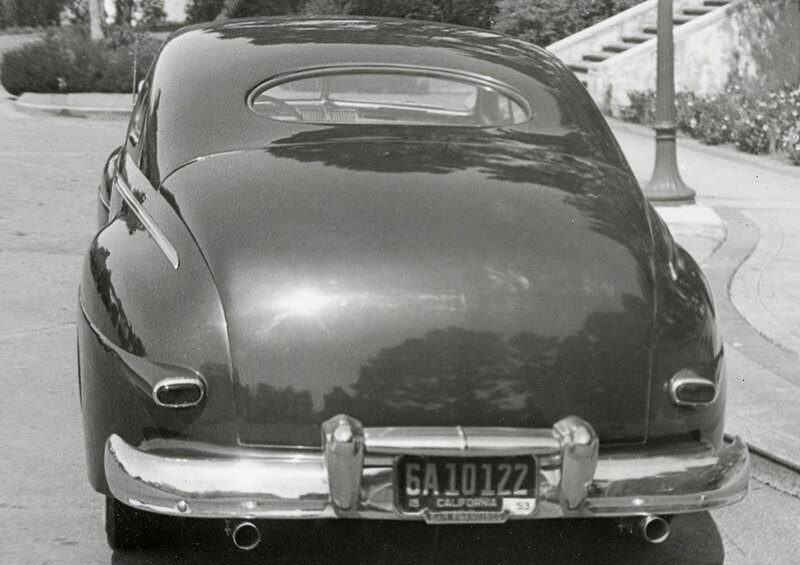 In another photo showing the Dan Landon 1949 Chevy, that I scanned from Andy Southard’s Custom Cars of the 1950’s book, we can see a small portion of Jack’s 1942 Ford. What is really interesting about this photo is the Carson letters above the car on the curtain’s behind the cars. Since all the cars parked on this wall are Barris creations I assume that the Barris and Carson shop joined forces on the display. And most likely it means that the interior in Jack’s Ford was done by the Carson Top Shop. We can see the dark headliner with white piping in this photo. That looks like Dan Landon with the dark suite and cigarette, not sure who the guy on the right is. This is the best I could do with the text on the show card at the 1952 Motorama show. Sadly the plants are covering up part of the good info. 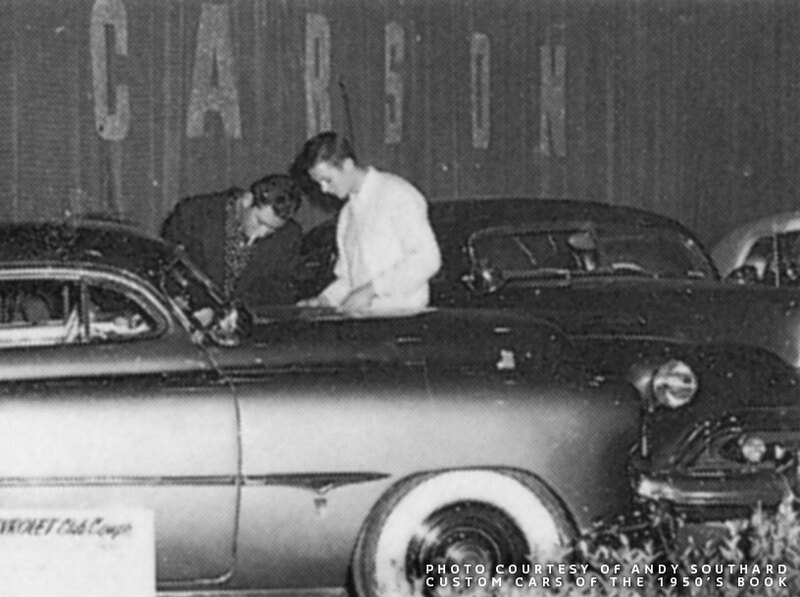 The Barris Kustoms / Carson Top Shop display wall at the 1952 Petersen Motorama show was made up of 6 top customs. And Jack’s 1942 was part of them. 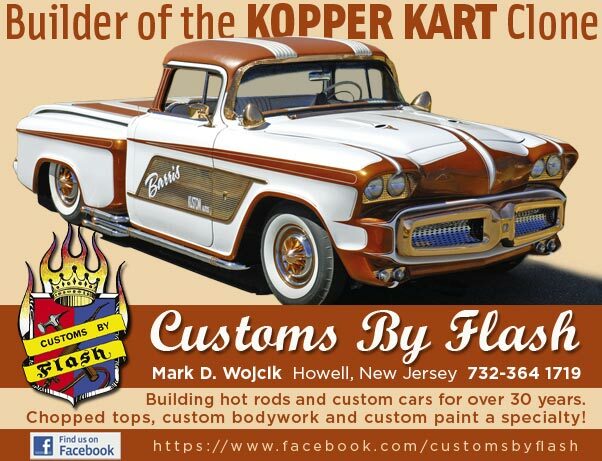 The other 5 where, Tommy Thornburgh’s 1947 Studebaker, Robert La Briola’s 1949 Oldsmobile, Dan Landon’s 1949 Chevy, Don Vaughn’s 1947 Buick and Bob Hirohata’s Mercury. So both Barris and Carson must have been very proud of the car, or at least thought it would look good at the show, and more important could draw more customers to both shop. Perhaps the fact that Jack was from San Francisco is the reason why it was never featured in the main magazines from 1952-53. 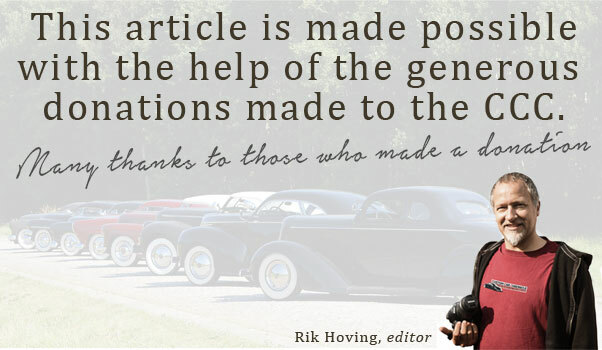 All early Hot Rod and Custom Car magazine publishers where located in LA and surrounding era’s, and to shoot a car from as far as San Francisco might not have been an option back then. But we don’t really know. 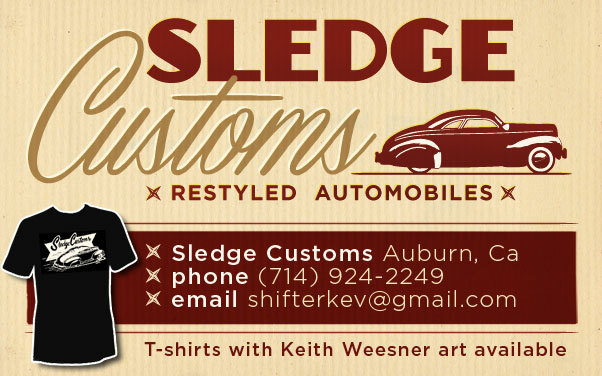 There are of course a lot of high end build customs from the late 1940’s, early 1950’s that never made the magazines. We have to thank Andy Southard very much for showing us that wonderful photo he took at the 1952 show and include it in his Customs of the 1950’s book. Otherwise we might have never really knew much about Jack’s Ford. Fortunately we have come across some more photos of the car, taken in 1953, that show us some different angles of this great Custom. The October 1951 issue of Popular Science showed an article about the Barris shop, it showed two photos of the Jack Brumback 1942 in progress. George Barris pretending to lead the molded in headlights bezels showing the new grille opening for the Olds grille surround, and the other photo of the new created taillight pod that has been welded to the rear fender. The smooth tapered chop is especially unique on this car. I think Sam really wanted to experiment with a more pronounced taper on this one. 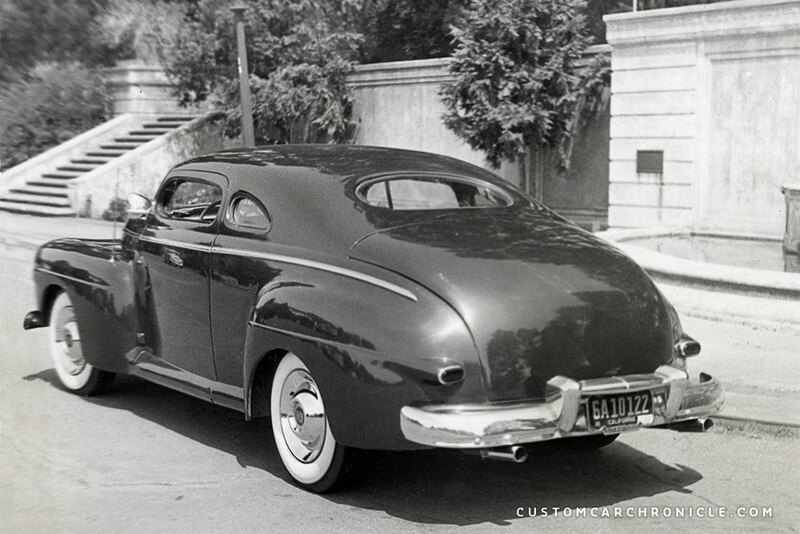 This is one of the few Barris custom that has such a large taper that even the door side windows are not level but actually smaller towards the rear of the door compared to the opening at the A-Pillars. The rear side window is reduced to a very small opening in the process. According to the sign next to the car the top was chopped 5 inches in the front and 7 in the rear. 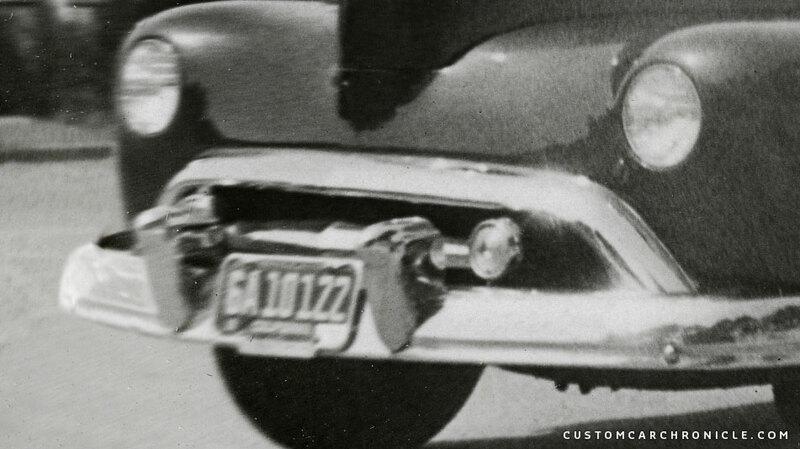 It appears that the windshield is angled back a few degrees as well, which was done with most of the Customs created from pre 1949 models at the Barris Shop. The whole chop on the Brumbach car reminds me a lot of the chop Sam and Jesse performed on the Jessy Lopez 1941 Ford and the one Sam did on the Marcia Campbell 1942 Ford– with the exception that the Lopez and Campbell Fords had level side window openings and more of the original Coupe looking top. Jack’s car was shown at the 1952 National Roadster show in Oakland California. Which was close to home for Jack who was from San Francisco. The ’42 Ford is parked next to the Barris-built Ralph Testa 1950 Mercury at the show. Interesting is that the car still has the fender skirts and a Kustoms Los Angeles plaque hanging from the license plate frame below the 1950 Mercury bumper. The front of the car was completely reshaped around the 1950 Oldsmobile 98 grille surround. A new section was formed to fit above the Olds grille and to flow up into the fenders and onto the hood. The make it all work even better the headlight bezels where molded into the front fenders, “frenched” and everything smoothed to flow as it had belonged together in the first place. Inside the Oldsmobile grille surround floats a very beautiful piece made the end sections of a 1950 Henry J grille. A 1950 Mercury bumper, which is much taller than the original 1942 unit first perfectly with the modified front end of Jack’s Ford. The hood was removed of it center chrome strip, peaked and the side trim on the hood was shortened. 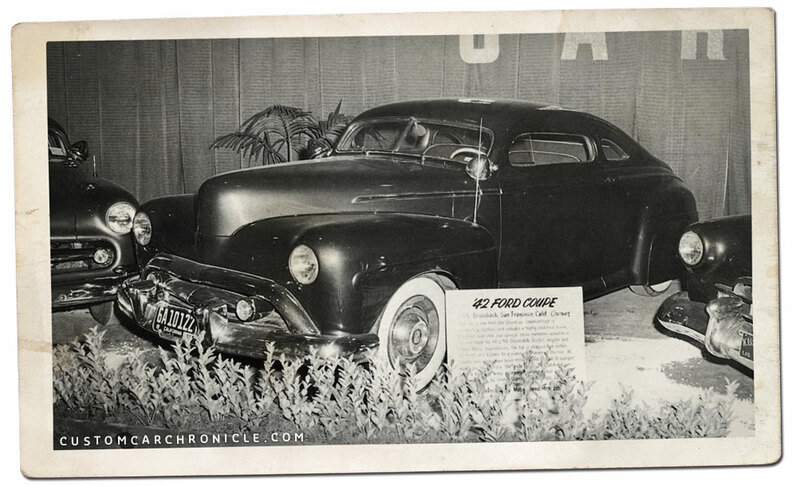 Some time ago I received some very interesting scans from the Jack Brumbach 1942 Ford taken from a set of 1953 photos. When these photo were taken the car had changed a bit over the look we are more familiar with from the 1952 photo. The fender skirts were removed and the car was raised in the rear and now having a slight forward rake. In this 1953 photo we can see the radical chop of the Jack Brumbach really well. 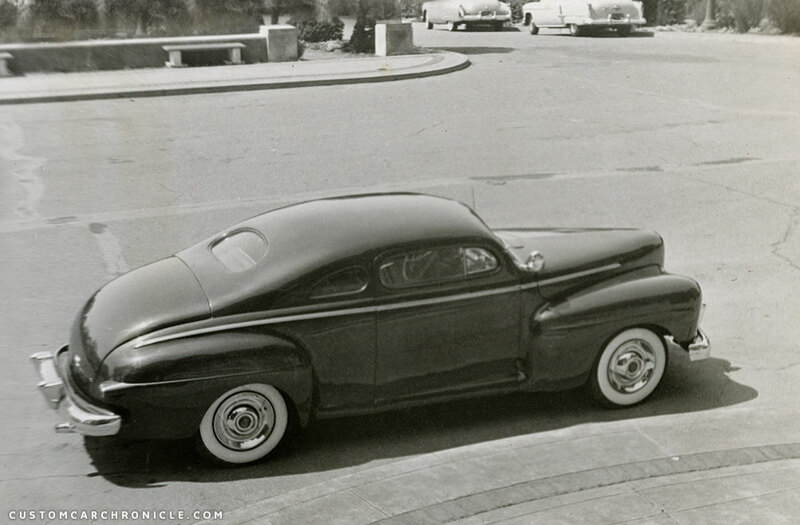 The rear of the top flows almost like a fleetline model. The show card lists the chop as 5 inches in the front and 7 in the rear. And most likely the quarter panels reshaped by the California Metal Shaping comp. By now Jack had removed the fender skirts and raised the rear a few inches for a completely different look. Cropped section of the photo gives us a good look at what is going on at the front of the car. The 1950 Oldsmobile 98 grille bar dictates the look of the front. Inside there is a grille made up from the end sections of an 1950 Henry J grille. The bumper is 1949-50 Mercury unit. I think it had to be narrowed a bit to fit the Ford body. The portion of the body above the Olds grille was completely reshaped, the headlights frenched/molded in, and everything smoothed to make it all flow really good. Birds-eye view shows the wonderful lines on Jack’s 1942 Ford. This rear quarter view show again how really well done the chop is done. Despite the heave chop there is no flat spot to be found on the roof at all The only thing that might have helped flow the top even more would have been rounded trunk corners. The fact they corners are not rounded also indicates the majority of the body work was done in the late 1940’s, early 1950’s. Lower angle show the flow of the new molded in taillight pods with 1946-48 Ford lenses. The Mercury rear bumper is most likely narrowed to fit the Ford body. The horizontal bar between the guards comes from the 1950 Mercury model. 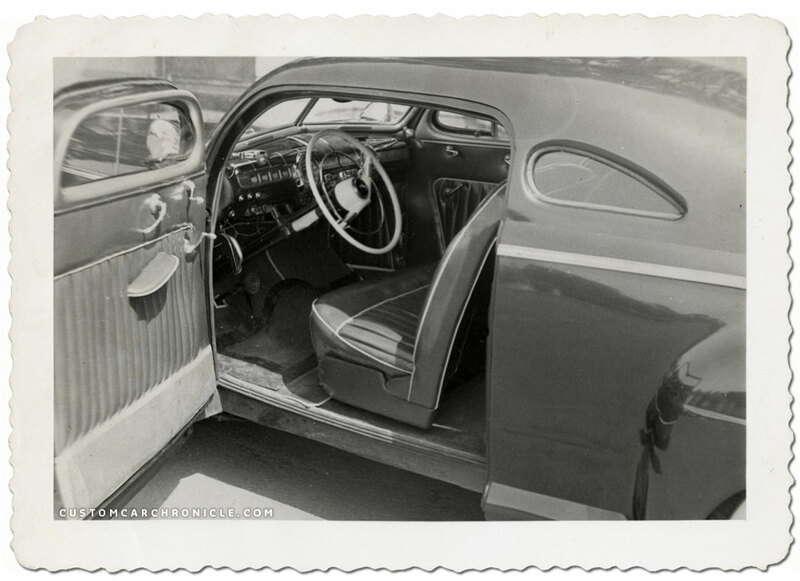 Notice how the door metal was extended to fill the hole where the running board once was. This wonderful photo shows the dark colored Carson Top Shop interior The shop used light colored piping on all the edges for a nice contrast and modern look. The photo also shows the lack of running boards on the car. 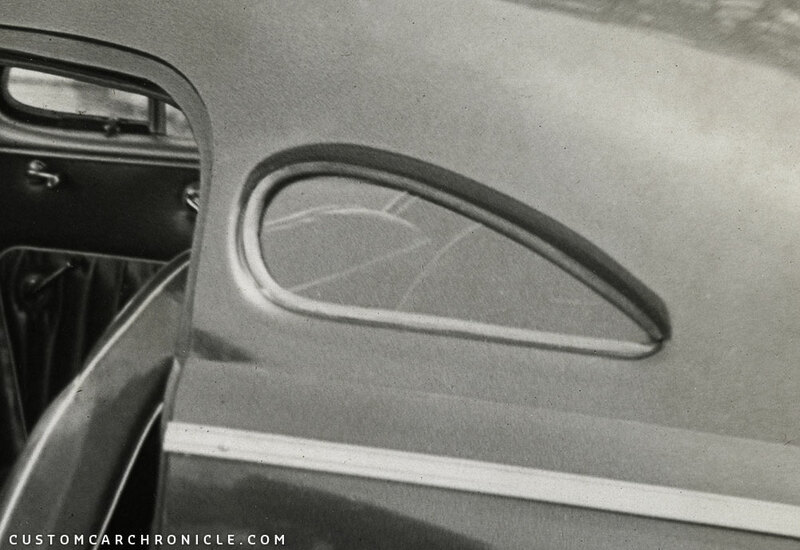 Close up on the rear quarter window show the teardrop shape needed for the heavy angled back chop. The glass actually ends in a point shape at the back. 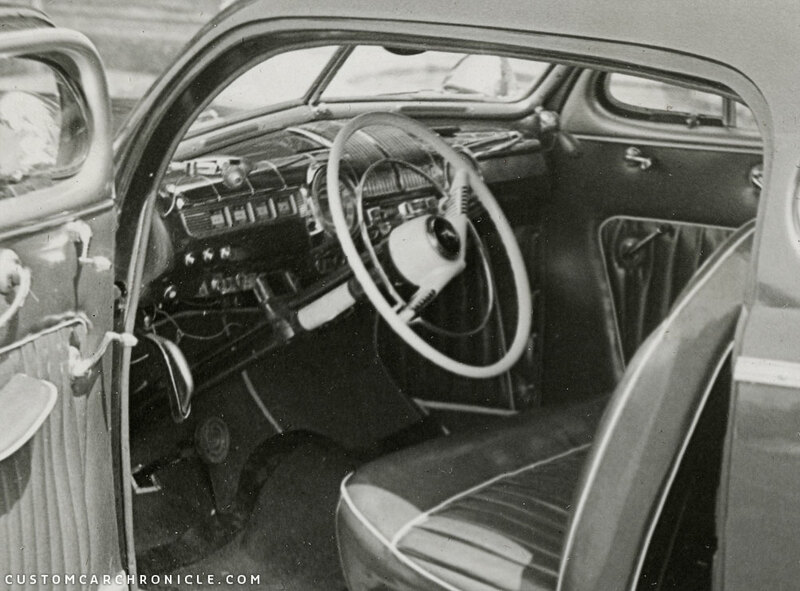 Mercury Monterey accessory steering wheel was a popular. The wires running from the Appleton Spotlights handles indicate these were actually working units. Close up shows that the taillight pods extend from the rear fender character line, and that the pods actually flow with the shape of the rear fender, making them turn inboard a little. Notice how the way the taillight pods are molded into the rear fender matches the feel of the fender character line. The rear splash pan was molded to the body and most likely had to be reshaped to make the Mercury bumper fit. 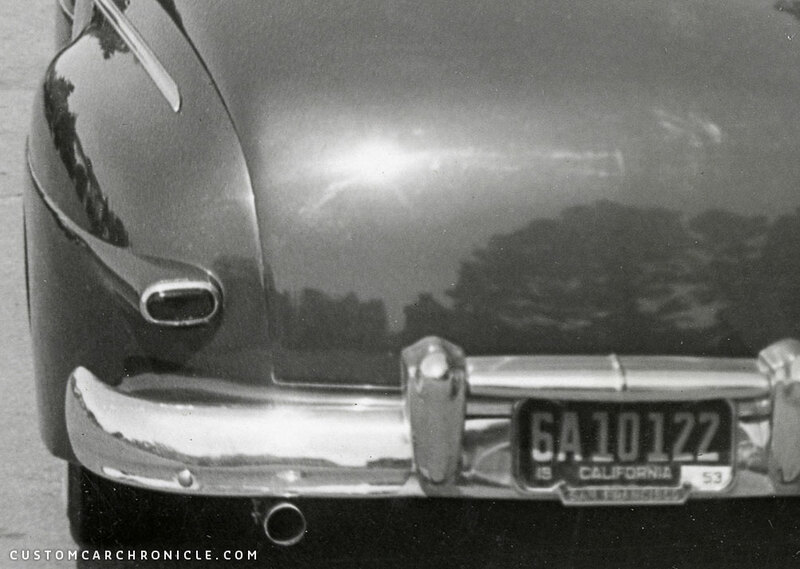 The 1953 tagged plates are set in a “San Francisco” frame. 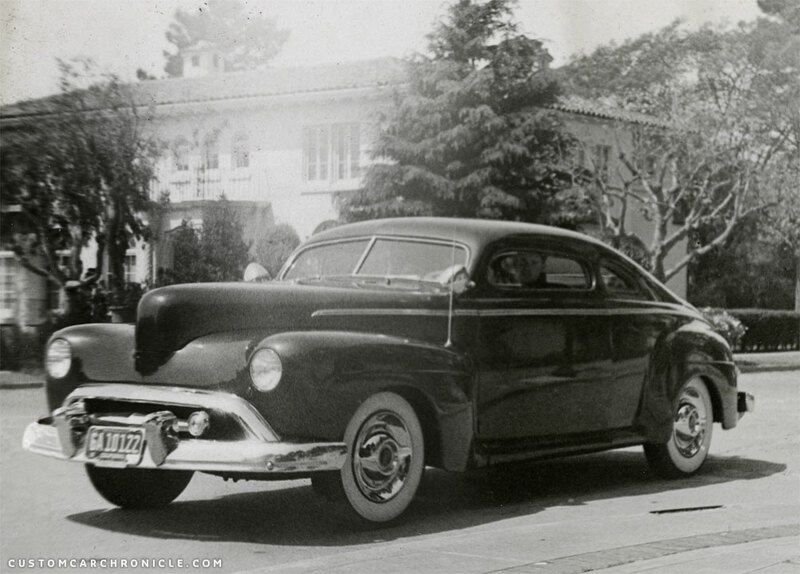 For many decades the Jack Brumbach 1942 Ford has been quite a mystery car. We have been able to lit some light on this car with the information we have found, but there is still a lot we do not know about this car, or Jack himself. Hopefully this CCC-Article will help find more info on both. 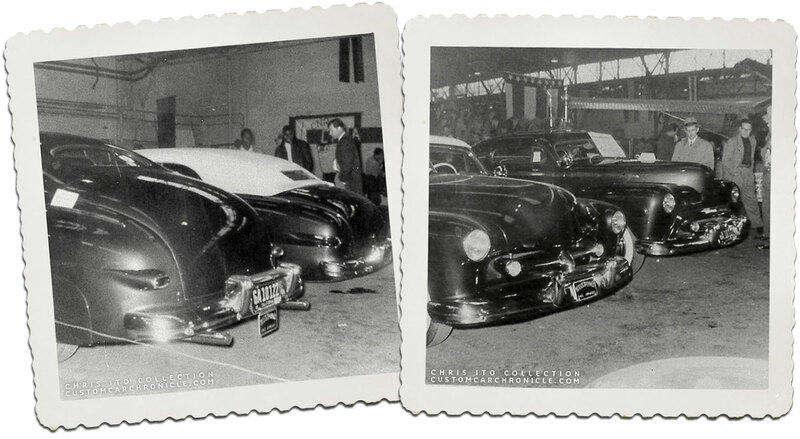 The 1953 photos we used in this article is the last we have been able to find on Jack’s 1942 Ford. We have not been able to find anybody who could tell us more on the car, what happened to it after 1953, if it is still around today, or perhaps long gone. 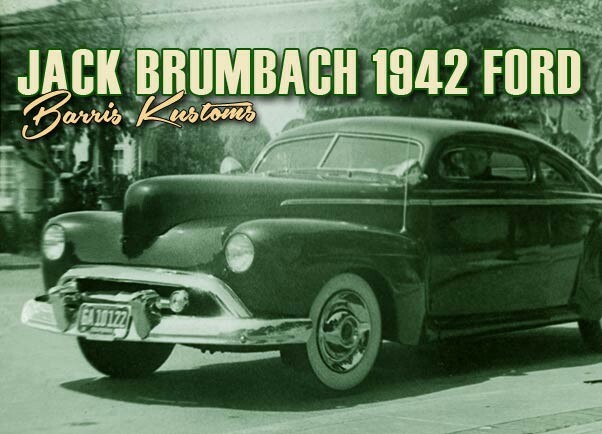 Of course we would really like to know more, so if any of the readers here on the CCC knows more about Jack Brumbach, or his 1942 Ford, please let us know, email Rik. We would love to add any new information to this article, to be able to finally give this great looking Barris Custom the attention it deserves. Thanks again, Rik, for taking us along for the ride in your detective missions. Your observation powers and detailed analysis contribute every bit as much as the actual images you unearth. It’s an example of a really nice early custom and a little different from the accepted cliches.. Thanks for sharing and all the information. Another awesome example of the “fat-fendered” customs around at the mid-last century era. Those lines are inspiring! Rik, do you suppose that George or Andy may recall what colour Jack’s ’42 was? As has been said – Thanks for your insight on these great creations!